Did you know that a 27-story luxury high-rise apartment is planned for Union Square? Or that the City approved over 200 parcels in Union Square to be taken by eminent domain? Or that even after more than 150 Somerville residents showed up at the meeting to protest it, the unelected Planning Board gave the developers at Assembly Square a waiver from the city ordinance that requires 20% affordable housing in new developments? You shouldn't hear about these things only after they have been approved. The city has a state-of-the-art system for notifying citizens about parades and snow emergencies. When it comes to important matters that the Board of Aldermen in considering, there is only silence. We can do better. Information about planning and zoning board meetings are only mailed to property owners, not the rental tenants who will live next door to the projects that get approved. How can residents engage with local government and consider the issues if they aren't actively informed of the city's business? We can do better. You should have easy and frequent access to your Alderman. I live and work in Union Square. I will hold frequent office hours and return your phone calls. Above all, I believe that holding political office is a public service – not a career. I’m not accepting any contributions from real estate developers because I believe your alderman should only work for you. Your voice as a resident of Somerville should help define how Somerville evolves, and then the city can find developers who will fit into that vision. Somerville should be prioritizing green spaces, civic spaces, playgrounds & parks to keep this community livable–and fighting for them in the deals we negotiate with developers. We need action to address the growing opioid epidemic affecting us all, and services to help families in the most need. We should also strive to lead the way in fighting the childhood obesity epidemic. Commercial tax receipts are typically triple those of similarly-sized residential properties. Increasing commercial development would allow Somerville to fund our schools and public services adequately and substantially reduce residential property taxes. In addition to increased tax revenues, expanded local employment would also reduce the amount of traffic and pollution our city already suffers from, reduce parking pressure in our neighborhoods, and enable us to improve walking and biking safety in our intersections. 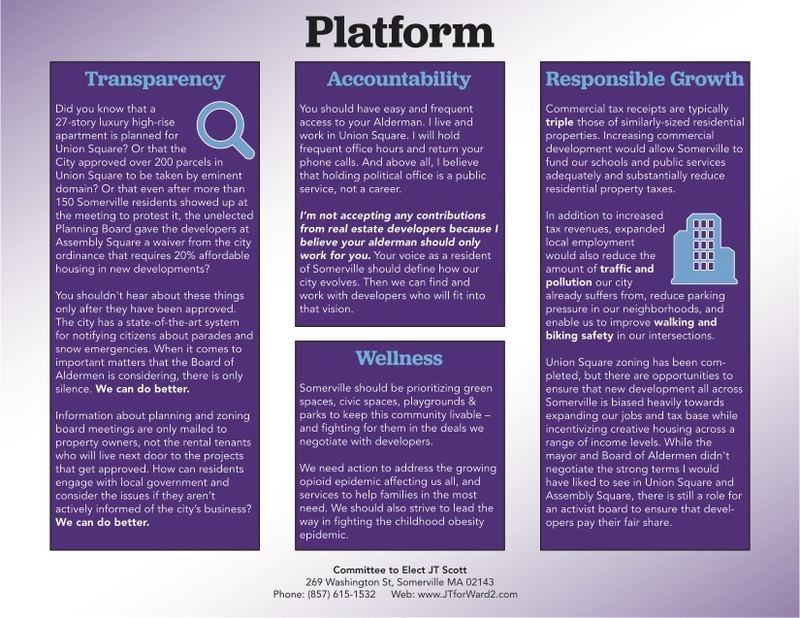 Union Square zoning has been completed, but there are opportunities to ensure that new development all across Somerville is biased heavily towards expanding our jobs and tax base while incentivizing creative housing across a range of income levels. While the mayor and Board of Aldermen didn't negotiate the strong terms I would have liked to see in Union Square and Assembly Square, there is still a role for an activist board to ensure that developers pay their fair share. Whether you own or rent, you are feeling the squeeze. I've talked to renters who are forced to move every year by rising rents and doubt they'll ever be able to afford to buy. I've talked to older residents on fixed incomes being forced out of their homes by rising real estate taxes and utility rates. I've talked to families who have lived in the same house for generations who are now finding their adult children can't buy homes nearby, and are instead being pushed out to other cities. We need bold action to preserve the community we all share whether we've been here three years or three generations. We can do better. The city should develop a robust program of incentives for landlords who rent units in the multi-family homes and triple deckers where they live to keep rental costs as low as possible. Multi-family homes make up a large part of Somerville's rental properties and most landlords don't want to raise rents past a level they know their long-term neighbor tenants can afford–but with rising property taxes they often don't have a choice. A Benevolent Landlord Tax Credit will reduce the property taxes for live-in landlords who commit to keeping rents affordable. This would mean that when an owner sells a property with rental units, the first opportunity to buy would go to the tenants already living there. 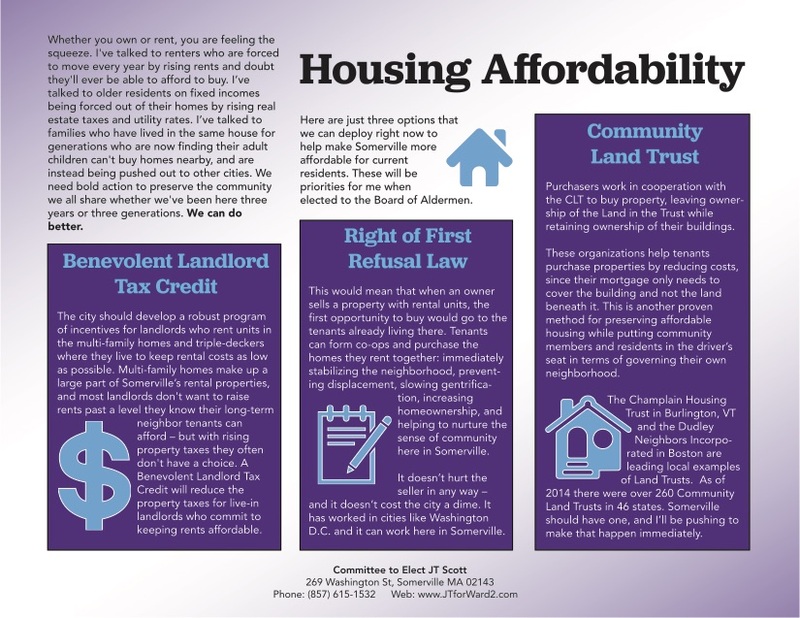 Tenants can form co-ops and purchase the homes they rent together; immediately stabilizing the neighborhood, preventing displacement, slowing gentrification, increasing homeownership, and helping to nurture the sense of community here in Somerville. It doesn't hurt the seller in any way–and it doesn't cost the city a dime. It has worked in cities like Washington D.C. and it can work here in Somerville. Purchasers work in cooperation with the CLT to buy property, leaving ownership of the Land in the Trust while retaining ownership of their buildings. These organizations help tenants purchase properties by reducing costs, since their mortgage only needs to cover the building and not the land beneath it. This is another proven method for preserving affordable housing while putting community members and residents in the driver's seat in terms of governing their own neighborhood. The Champlain Housing Trust in Burlington, VT and the Dudley Neighbors Incorporated in Boston are leading local examples of Land Trusts. As of 2014 there were over 260 Community Land Trusts in 46 states. Somerville should have one, and I'll be pushing to make that happen immediately.